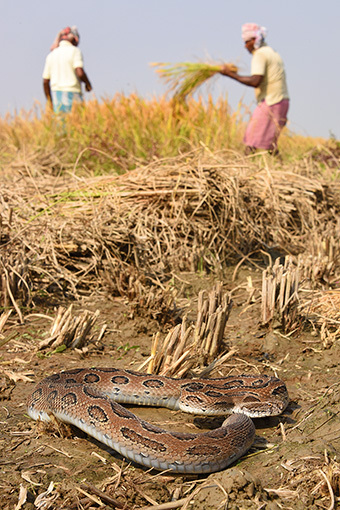 Farmers in West Bengal are exposed to bite by venomous snakes when tending and harvesting their crops. India has the globally highest annual death rate from venomous snake bites and in some states it is the largest contributor to mortality, exceeding even AIDS and malaria. Data on snakebite is significantly lacking from the north-eastern and Himalayan belt States, where the “Big Four” medically significant venomous snakes are replaced by different sets of venomous snakes. This has serious consequences for the ability to treat cases of snakebite. Clinical management of snakebites requires timely administration of antivenom (referred to in India as anti-snake-venom serum, or ASVS), neutralizing the life-threatening toxins in snake venom. However, venom composition varies both between and within species, and so the design and production of efficient antivenins depends on thorough understanding of venomous snake diversity and distribution. The resulting biological information and standards from this project will contribute to improving the outcome of snakebite and provide a baseline for future work. This project is funded by the European Union Seventh Framework Programme under the grant agreement number PIRSES-GA-2013-612131, with additional funding from the Bangor University ESRC Impact Acceleration Account. 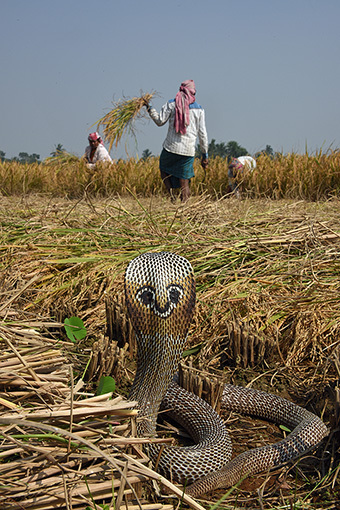 To address the lack of studies investigating the link between venomous snake systematics and regional venom variation in India To establish a network of experts based in the EU and India (taxonomists, molecular biologists, protein biologists, epidemiologists, clinicians and herpetologists) to enable co-ordination of methods and effort. To train early-career researchers in leading-edge techniques (eg the “omics”: genomics, transcriptomics, proteomics, antivenomics) as well as more traditional techniques in herpetological systematics to ensure continued focus on the problem after the lifetime of this project.